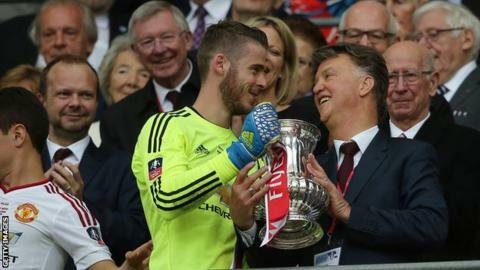 It is almost three years since Louis van Gaal walked into a Wembley news conference and slammed the FA Cup on to the table. The Dutchman had just completed what he regards as his greatest managerial achievement: "Winning a trophy despite having a noose round my neck for six months." Within minutes of the final whistle of Manchester United's victory with 10 men against Crystal Palace, it was reported he would be sacked and replaced by Jose Mourinho. I met Van Gaal in Portugal last week for his first written interview with a British journalist since that day. He looked well, energised and now free from the stresses of over four decades in professional football. The previous week he had confirmed his retirement. Over the course of a fascinating 90 minutes, Van Gaal, now 67, was his usual charismatic self. He laughed - a lot. When he had a specific point to make he would reach out and give my leg a push, to make sure I was paying attention. If I said something he disagreed with, he would lean back, scoff and dismiss the remark with a wave. Every so often he would finish an answer with a question that demanded a response to the specific point he had made. He asked, more than once, for me to tidy up his sentences because his English "is not so good". He broke off the interview to pose for a photograph with a fan, but not before asking me if it was OK. Van Gaal places huge importance on attention to detail in his personal relationships. It was clear the manner of his exit from Manchester United still rankles. To get to the crux of his resentment, wind back to the spring of 2014. United were trying to pick their way out of the disaster created by the decision to appoint David Moyes as Sir Alex Ferguson's successor. They wanted someone with a track record of success who would not be overwhelmed by the job. Van Gaal fitted the bill. Moreover, he was available as his contract with the Netherlands would expire after the World Cup. Tottenham were also interested, but United's pulling power was persuasive. "Tottenham were a better selection because Manchester United were an old team and I knew I would have to transform them," Van Gaal says. "Was it the wrong choice? Maybe, but I follow my heart. I worked at the number one team in the Netherlands, Germany, Spain and now also in England." Van Gaal wanted a two-year contract. It would take him to the summer of 2016 and fulfil a pledge he made to his mother during his younger days that he would retire when he was 65. United wanted him to commit for three. He says: "The Glazers [the club's owners] and Ed Woodward [executive vice-chairman] asked me. That is why I am still angry with the way they chose to do it. Ed Woodward knew Manchester United would be my last club." Van Gaal was also aware restoring the club to its former glories was not going to be a speedy process. "They had seven players over 30," he says. "We spoke about that at the job interview. In my first year we qualified for the Champions League. In my second we won the FA Cup." On 21 November in that second season, United won 2-1 at Watford. They were second in the Premier League, a point behind eventual champions Leicester. Their next five games yielded two points in a disastrous period during which they were also eliminated from the Champions League. As supporter disenchantment with perceived negative football grew, Van Gaal's position as manager came under increasing scrutiny. Without Van Gaal's knowledge, contact was made with Mourinho. To this day, United are adamant no job offer was made. Alternative sources from outside Old Trafford said otherwise, the media ran with it and Van Gaal found himself in an impossible situation. "I can imagine Woodward chooses Mourinho," says Van Gaal. "He is a top coach. He has won a lot of titles. More than me. "What I don't like is Woodward contacting my successor, knowing in his mind he will replace me and he keeps his mouth shut for six months. Every Friday I had to go into press conferences and be asked what I thought about the rumours. What does that do to the authority of the coach? "To win the FA Cup when, for six months, the media has a noose round my neck, is my biggest achievement. "I spoke to Woodward the day after that game. His argument was that I was only going to be there for one more year and Mourinho would be there for three, four or five. I appreciate he hired a private plane to get me back to Portugal but his arguments were not good enough." Van Gaal gets animated when the negative view of his football is pointed out. "It is not true," he argues. "You say it was boring. Why was it boring? Maybe it was boring-attacking but that was because the opponent parked the bus. Then you have to play at a higher tempo, which is difficult. Then you have to see what kind of players you have. "Wayne Rooney should have been the number 10 but Robin van Persie was not fit enough for the Premier League, which meant Rooney was the best striker we had. But Manchester United needs the best striker in the world." He tried to address the problem. In came Angel di Maria, Radamel Falcao and Bastian Schweinsteiger. Huge names at huge expense. The first two lasted a single season, Schweinsteiger made four appearances in his second before moving to Major League Soccer in March 2017. Di Maria recently blamed Van Gaal for his United failure because he picked him in the wrong positions. "Di Maria says it was my problem. I played him in every attacking position. You can check that. He never convinced me in any of those positions. He could not deal with the continuous pressure on the ball in the Premier League. That was his problem," says Van Gaal. "I brought Schweinsteiger in because we needed a captain on the pitch. He didn't do it. He was injured. He had an excuse. Over the course of our conversation, Van Gaal returns to a theme. The media has power to influence but they do so on a very limited amount of facts. As an example he explains how Ajax were lucky to beat Real Madrid in the Champions League earlier this month and why, despite losing at the Amsterdam Arena, they were much better at home in the first leg than they were in the second, which is considered one of the great modern-day performances by a Dutch team. "The media do not analyse the game," he says. "They analyse the result." "People think we have only had fake news since Donald Trump became president. In football we have had it for 50 years," says Van Gaal. "The coach after me [Mourinho] changed to park-the-bus tactics and played on the counter. Now there is another coach who parks the bus and plays on the counter. The main difference between Mourinho and Solskjaer is that Solskjaer is winning. "Solskjaer has just lost twice and he has to manage that. It is very important that Manchester United qualifies for the Champions League, as it was when I was manager. But they can also win the Champions League because they play a defensive system and it is very difficult to beat them, which, whether you like it or not, is the result of Mourinho's work." The previous day Van Gaal gave a talk to a League Managers' Association meeting and he remains hugely sensitive to the difficulties all managers face. He has opinions, lots of them, but at no point, either on or off the record, is he critical of anyone who puts themselves forward for the job. Although he has noticed how quickly one of his major critics decided he had himself taken a wrong move recently, 31 days after his appointment by Oldham. "Paul Scholes was a manager too, yes?" he smiles. "Fantastic, eh. Fantastic." Van Gaal is amused at "being retired by the media" as he says his recent comments only repeated something he said first in 2012. Yet he also reveals he received two job offers a month after leaving United. Not all of them were dismissed out of hand. "They were from the highest level," he says. "Not too much from England but a lot in Germany, Spain, USA, Mexico, Argentina. I had big doubts twice. I asked my wife, Truus, but she said no. The last one was Feyenoord. She wanted to do that because she is a Feyenoord fan but I am a consistent man." There is a public perception of Van Gaal that he enjoys being the centre of attention. He says this is misplaced. How long, he asks, have I been asking him for an interview? The answer is about once a month since his United exit. If he was addicted to attention, he argues, why would he wait so long? "Everybody thinks I am a narcissist. I am actually the opposite of that," he chuckles. "The media likes me because I give honest answers. How many people in football give honest answers? I don't lie. Always the truth. OK, maybe my truth. But it is the truth." In the aftermath of Mourinho's exit, United sources stated clearly the appointment of a technical director was on the agenda, in addition to a new manager. At present, nothing has changed from Van Gaal's time, with Woodward in overall charge and Matt Judge, who has a masters degree in economics and finance and 13 years' experience in investment banking, negotiating fees and contracts. United are adamant their priority is the football side and success on pitch is the objective for everyone at the club. Van Gaal does not agree. "At the moment there is a structure with a scouting division and above that is someone at Woodward's right hand. The structure is not so bad but the right hand has to be a technical director with a football view, not somebody with a banker's role," Van Gaal says. If there is one aspect of Van Gaal's illustrious career for which he will be remembered, beyond the trophies, it is the number of young players he picked. Van Gaal gave debuts to Clarence Seedorf, Patrick Kluivert, Edwin van der Sar, Carles Puyol, Xavi, Andres Iniesta, Thomas Muller, all now established names at football's highest level. There are many, many more, including Marcus Rashford from his time at United. He says: "I read something from Mourinho saying I only did that out of necessity. Not true. I created the necessity. But the journey to the top is not exclusively to do with ability. "Your personality is also very important. In my time, Rashford was very modest and I thought he would reach the higher level," Van Gaal says. "I knew players with the highest ability to kick a ball from A to B but as a human being, no. Then you can forget it." There are eight teams left in the Champions League. Van Gaal managed three of them - Ajax, Barcelona and United. He knows United fans in particular will be annoyed at his preferred outcome. "People think Barcelona are the best but they are not. Manchester City and Liverpool are more of a team than Barcelona - and Liverpool are more of a team than City," he says. After 46 years, Van Gaal's active career in football is over. Now he is creating "my own future", with his wife, his children and grandchildren. A house move on the Algarve is nearing its final stages. Pushed to assess his legacy, Van Gaal reveals a softer side, which, he feels, is a more accurate reflection of the man he really is. "I have a philosophy. I was convinced of it and by winning trophies in four countries, I proved the philosophy worked," he says. "But my legacy is bigger than just my results. I am also a relations coach, not only with my players but everyone in a club. "It is not my image but I am very human in that way. At Manchester United there were more than 40 people in the performance department. The medical department, the fans. They all had a heart for the club. I went to work as an analyst at a game at Liverpool and the United fans were still shouting my name. "I am proud people still like me. That is what is most important in life."